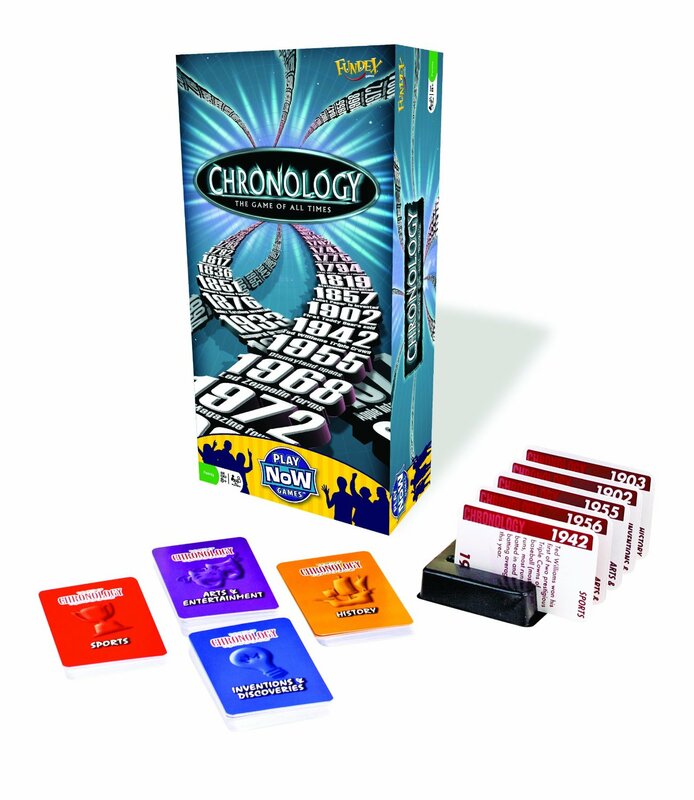 Chronology: This is one card game that has surpassed the evolution of social entertainment over the years and has continued to bring amusement to consumers the world over. It’s practically a game of pushing your luck, which can go along with how well you know your history. Nonetheless, the entire goal of the game is for players to relish the sense of interaction with the company of family and friends, or whoever they’re playing with. 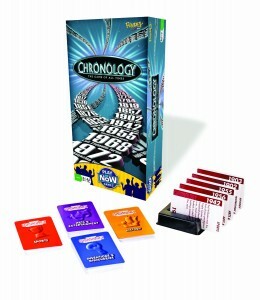 The first edition of Chronology, a party card game, came out in 1996. There have been other editions released throughout the years; the manufacturers released a junior edition intended for children below 13 years old and a sports edition – for sports enthusiasts/hobbyists. The latest version had minor changes made, but in any case, the original essence and quality of the game is still there. The objective of the game is for players to form a timeline of events that occurred in history (with a corresponding year when the certain event happened) written on the cards. First one to correctly align 7 cards wins the game. A set begins with one card for each player; then a random player starts by drawing a card from the box and reads what’s in it (except for the year written on the card) to the player on the left. That player will then take a guess where to place the card on his timeline. If he guesses correctly, he takes the card and adds it to his timeline. He then has the opportunity to take another guess; his turn ends when he gets a guess wrong – with this, the cards he acquired in that particular turn must be discarded. On the other hand, if he gets it wrong on the first try, the next player gets to guess at the card and the games proceed. The card game has neither a timer nor a board which makes it easy to setup and easy to store when not in use. The events included in the set are from a plethora of categories – from current events, arts and sciences, entertainment, the greatest inventions, famous geographical discoveries, popular culture, general knowledge, to history dating back centuries. A player doesn’t really have to be a history geek to enjoy the game. Plus the fact that you only have to guess the events in an estimated way is like playing a mystery game; you aren’t really sure whether to trust your instincts or just take a wild guess. But that is the real thrill of the game which makes it nerve-wracking and amusing. If you find the “Race to 7 Cards” too easy and tedious you can always bend the rules and amplify the race to 15 cards; or you can even set a timer to create a fast-paced gaming sensation to the players. Be creative: the possibilities are endless! You can find the Chronology Card Game almost in all toy stores and on ecommerce sites such as eBay and Amazon. If you have comments or suggestions, feel free to share them below.